Ice and snow push winter tyres to the limit - and yet there is no moving forward under certain circumstances. Especially in the Alps or other winter sports regions snow chains should be part of the vehicle equipment. In some places snow chains are mandatory shown by road signs (round blue sign with a snow chain symbol). At 123tyres.co.uk, you'll find proper snow chains. 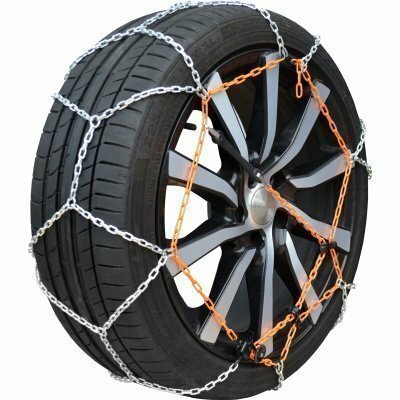 Of course, we will help with getting these chains on tyres as well. No matter which size winter tyres or snow chains you want to buy for your Audi or any other type of vehicle, the perfect grip is assured. If you are looking for especially impressive discounts, you might even want to purchase your snow chains and winter tyres during the summer months. Our large selection includes several brand name manufacturers. No matter what kinds of chains are right for your vehicle, we have what you are looking for so that you can stay safe when faced with icy conditions. Meanwhile, several snow chains types are available on the market. Netted snow chains are placed around the tread of the tyre. Drive chains, which are mounted transversely to the tread only on the drive axle prevent wheel spinning. In contrast, the non-skid chains are made for the steering axle. They help preventing lateral slippage. Snow chain sets consisting of drive and non-skid chains are best. However, these are not necessary if you only want to leave the snowy driveway of your property - traction aids will last out. Before purchasing inform about the rules for snow chains in your target area. Those who are not prepared are risking a fine. In addition, there are many snow chains tests that check, among other things, how easy they can be mounted. If that is important for you, choose a product without chain parts on the inside of the wheel. Of course, we can also help with winter tyre fittings or fitting your snow chains in person. Simply trust in one of our local service partners to get the help that you need. Correctly mounting your snow chains is also important for your safety, wherefore you should really make it a point to ask for help if you are not sure.